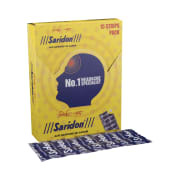 Saridon is a mild analgesic, primarily used as a pain reliever and used to treat mild fever. It is also used to get instant relief from the pain in the case of a backache, a headache, arthritis and a toothache. It also reduces pain in the body caused due to fever. It has a fast acting formula and provides quick relief. • Helps in reducing pain associated with fever,cold and flu. A licensed pharmacy from your nearest location will deliver Saridon Tablet. Once the pharmacy accepts your order, the details of the pharmacy will be shared with you. Acceptance of your order is based on the validity of your prescription and the availability of this medicine.